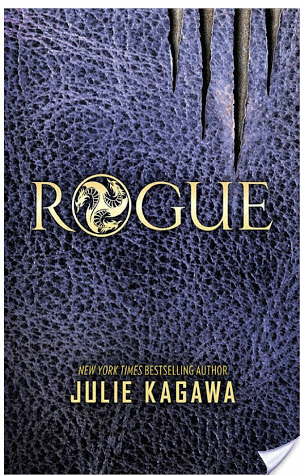 Rogue is Julie Kagawa’s heart pounding sequel to Talon, her dragon fantasy book. If you like Sophie Jordan’s Firelight series, I can practically guarantee that you will enjoy Kagawa’s Talon Saga. These books are the story of dragons who can Shift into human form and walk among us. Talon is the name of the overarching dragon organization that controls the species with the mantra do not reveal yourselves, the humans must not know. At the heart of Kagawa’s Rogue is Ember, a teenage girl with flaming hair and a rebellious streak. Rogue is the story of what happens when Ember escapes the clutches of Talon and is on the run with Riley, the motorcycle guy from the first book, Wes, his hacker sidekick, and Garret, the human soldier who defied his superiors at the Order of St George which is charged with driving the dragons to extinction. This story takes us to Vegas where Ember and the gang try to connect with some hatchlings while also running from Talon and St. George. Essentially they are living a war on two fronts and let’s just say that Kagawa does not skimp on action. If you like your young adult fiction love triangles action packed and filled with desire and longing, you have come to the right place with the Talon saga. There’s enough teen angst to fuel the story here. Kagawa writes it in a way that is not irritating, but compelling. At this point, I don’t know who I want to end up with Ember. What I do know is that I find both Riley and Garret fascinating. I find them to be well drawn characters and romantic leads. It probably helps that the chapters alternate between Ember, Garret, Riley and occasionally Dante. I felt like I really got to know the various characters and motivations. It also helped to move the pace of the story along. Just as the action started to fall, we would move on to another character and get the scoop and more pulse racing sequences. If you are a fan of Talon and Julie Kagawa, you absolutely need to put Rogue in your shopping cart. I skipped the review and synopsis because I haven’t read Talon yet but I just wanted to comment about how beautiful the cover is!! !